When Mattel debuted their WWE Legends series in the Summer of 2010 there were a lot of names that quickly popped into my head for future releases. Savage. Warrior. Hart. Beefcake. In fact, after the announcement of the first couple of waves, I sat down and scribbled out the Superstars I wanted on my shelf. Somewhere in the top 10 was Honky Tonk Man. Seriously. Nevermind the fact he is "The Greatest Intercontinental Champions of All Time", his gimmick was fantastic! Like a lot of those larger than life personas during the Golden Era of WWE, he translated well into action figure form and made him a popular with kids. At long last Mattel has tackled the Elvis-inspired blue suede Superstar (although not in "Legends" packaging) via the current "Flashback" pipeline running through the Elite series since wave 12. Hop into his pink cadillac and see how this cool, cocky, bad grappler turned out! We'll start off with a look at Honky's entrance attire, something which no doubt put a strain on the budget for series 21, but nonetheless there are couple of things missing. Most obvious is the ommision of his belt and I don't mean the IC title belt. I mean the cummerbund he wears over his jumpsuit. Mattel's design team noted that they initially wanted to make it a separate piece, but they were already over budget with HTM, so instead there was a running change that painted the belt directly on to the jumpsuit. As of this writing I have yet to see any of the 2nd run Honky's online, so I have no idea how that turned out. Truthfully, though, a separate piece is the best way to go on this. I have my fingers crossed that Ralph's comes up with something we can add-on. On the bright side, if you add the IC title to HTM, it eliminates the need for the jumpsuit's belt. The second issue with the jumpsuit is that they added the velcro closure a bit too high, so he doesn't quite get the mid-chest neckline when it's closed. I wonder if that might be corrected on the second run. The jumpsuit itself is beautiful, though. The fabric chosen is a great stand-in for Honky's suit and the amount of artwork and detail is truly impressive. It's much looser than HTM's actual entrance attire, but is still tricky to get off of the figure. The legs are flared at the end, adding a nice touch, but the artwork is the best part! Amazingly detailed guitars, a jukebox and records appear on the front and back of the jumpsuit. Each sleeve and pant leg features a flowing music staff with notes and more records. This could just as easily appeared in the defunct "Entrance Greats" line and is noticeably above the type of entrance gear we normally see in Elite. Once Honky is out of his jumpsuit he's made up of reused parts. His upper & lower torsos are the same used on Nikolai Volkoff & Demolition. His legs and knee-high boots have also been used throughout the Legends line. Most impressive is the headsculpt. Everthing from Honky's slick pompadour to his crazy sideburns to his cocky smirk are all present on the figure and painted very well. Honky's molded red tights are adorned with guitars and music notes on each leg, painted in white. You'll find "SHAKE - RATTLE & ROLL" stamped across his backside along with two music notes on each side. The boots are molded in solid white plastic without any addition paint apps. Because he has three guitars running down the side of each thigh, the potential for issues on the lowest guitar exist since they're tampographed over the knee peg. It's not too bad on my figure since the guitar image is mostly solid white. The jumpsuit is awesome, but you can't have a Honky Tonk Man action figure without a guitar! Mattel made sure to include one and as if that wasn't enough, it's gimmicked, too! The guitar is made of five separate pieces: the neck, the top, the sides and the back which has been broken in half. The pieces are held together via small tabs and friction. Ideally the guitar would break apart into it's individual pieces upon impact, but it doesn't quite work out that way for me. Most of the time the body of the guitar just pops off from the neck, staying intact once it bounces off a figure's head. I'm thinking of just gluing the neck in place which should allow for the top and back sides of the guitar to pop out when it's smashed on a figure. That should also help when displaying the figure because any little tap on the guitar causes the body to disconnect from the neck. Aside from that the guitar is very nicely detailed. It's molded in brown plastic and features yellow, black and silver paint to detail the top, strings and tuners. 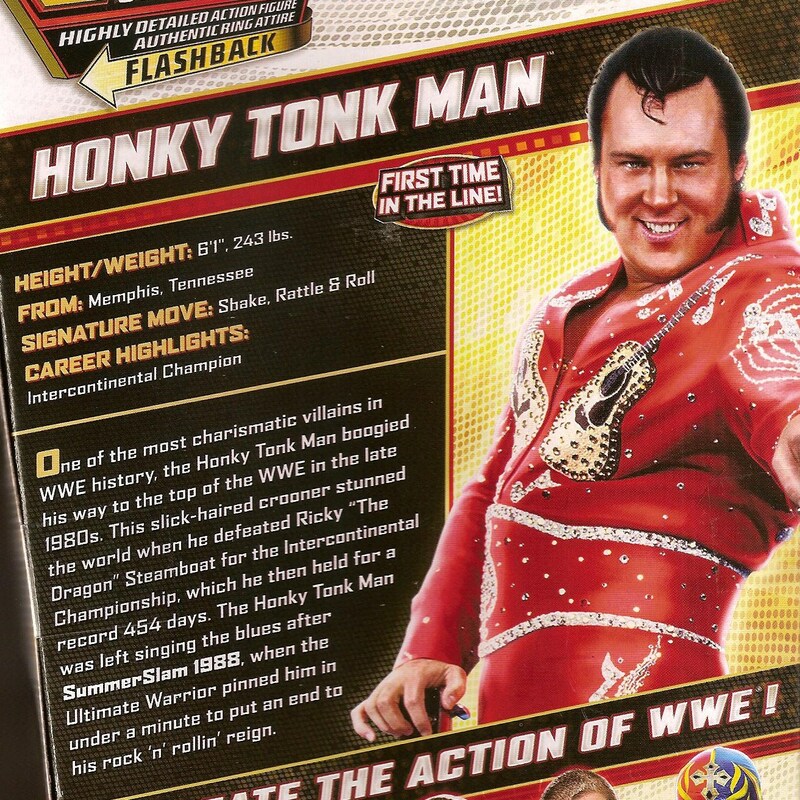 Whenever I think of Honky Tonk Man I picture him in his blue jumpsuit, probably due to the vintage Hasbro action figure, however, the design on this suit is arguably better than the blue one (not this blue one, though) so I have to give props to MDT on their choice and the execution. Is he perfect? No. The missing belt would have gone a long way to deliver a "perfect" HTM figure along with an IC title, but obviously that just wasn't feasible within the Elite price point. The good thing is it doesn't hold him back from looking really great on your shelf. A few things to watch out for: the jumpsuit material is thin, so be careful when removing it or putting it back on the figure, you don't want to tear it. Another thing you want to be careful with is when you initially remove him from the package. Apparently the paint had not quite dried when he was packaged and the suit was stuck to the inner plastic tray at several points. None of the design came off, but it was a scary procedure freeing him of his plastic prison. My figure also has an issue with the hip joint. The barbell that runs through the crotch would bend before the hips would rotate all the way back to allow the figure to stand up straight. It seems it was misaligned inside the hips. Fearing I'd break the leg off, I popped HTM in the freezer for a few hours then tried again. At that point I was able to wrench his legs all the way back, but there was a loud snapping sound when I did. HTM is packed 1 to a case in 21A and not at all in 21B, so you can expect him to be hard to find. No telling how much harder to locate the revised figure will be. I don't suggest you jump the gun and resort to eBay just yet, look how plentiful Elizabeth turned out to be, but you should definitely grab him before the scalpers do if you spot him at a store.